Vauxhall Energy is a registered community benefit society supported by ENGIE, Repowering London, Vauxhall Gardens Estate Residents and Tenants Association (VGERTA) and Lambeth Council. 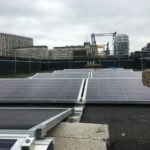 It is a community-owned solar power initiative in the Vauxhall Gardens estate in South London, which offered an exciting opportunity for individuals to support the generation of solar power in Vauxhall and to contribute to wider action to reduce dependence on fossil fuels. The scheme was funded by investors from the local community, who had the opportunity to buy shares and receive interest payments predicted at 3%. In addition, ENGIE agreed to contribute £15,000 towards the cost of installation, as well as carrying out the technical installation of the solar panels. A further £15,000 has been ring-fenced for the benefit of the community over the 20-year life of the project. The project has seen the installation of 65kWp of solar panels on five blocks on the estate, which will generate 1,059MWh of renewable electricity during the lifetime of the project, saving 24 tonnes of carbon emissions per annum. Vauxhall Energy has also been running energy advice and solar panel construction workshops, providing home energy audits and given nine local young people 20-week paid internships.